Hanging a shower curtain securely in a shower area requires heavy-duty hooks that can stand up to sudden, forceful jerks, pulls and tugs. Roller Style Shower Curtain Hooks provide a decorative, functional solution to your shower curtain-hanging needs. Smooth gliding action - the hooks glide easily over your shower rod, no snagging, no tugging, no pulling of the curtain. - heavy duty closed hooks - hooks are strong enough to hold a heavy curtain. This item is a Curtain Rings Hook. 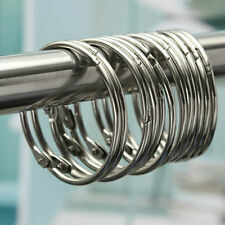 12x Curtain Rings (1 Set). Power by mabangAPP. Hanging a shower curtain securely in a shower area requires heavy-duty hooks that can stand up to sudden, forceful jerks, pulls and tugs. 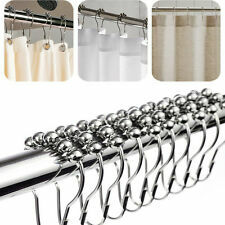 This Roller Style Shower Curtain Hooks provide a decorative, functional solution to your shower curtain-hanging needs. Material: Stainless Steel. That's our motto. And let's face it, everyone loves to find a bargain. It's human nature. Also note that monitor settings may vary from computer to computer and may distort actual colors. Creative Chef Strain Fry Frying Basket Strainer Foldable Washable Kitchen Tool S. Travel Secret Waist Money Belt Hidden Security Safe Pouch Wallet Ticket ProtectS. Colorful Sport Travel Unbreakable Portable Leak-proof Water Bottle Camping Cup S.
Condition: 100% New and High Quality Material: Stainless Steel Chrome Color: Silver Size: 77mm*3mm Package Includes: 12 x Rollerball Shower Curtain Rings Hooks. Kitchen Sponge Sink Baskets Drain Holder Storage Hanging Organizer Bag SE. Travel Pet Bowl Water Food Portable Dog or Cat Drink Dish Feeder Folding SE. Hammock for Ferret Rabbit Guinea Pig Rat Hamster Squirrel Mice Bed Toy House SE. Main Color: As the picture shown. Canada Rate (item arrived) 0.0% 47.1% 31.4% 17.6% 3.9%. Rate (item arrived). Modern Types Waterproof Fabric Bathroom Bath Shower Curtain Decor+Hooks Set 71"
Features: 100% brand new and high quality. Specification: 1.Material:Zinc Alloy 2.Color:Brown 3.Size:internal diameter:30mm/1.2in Note: The real color of the item may be slightly different from the pictures shown on website caused by many factors such as brightness of your monitor and light brightness. Sincerely hope you will understand. They fasten easily, glide smoothly and hold curtains securely. Has sturdy acrylic roller balls, designed for a smooth, noiseless glide. No More Tugging! Bye-bye, flimsy shower hooks! No More Annoying Snagging: Each ring features 5 acrylic roller balls, designed to glide smoothly and effortlessly; won't snag on the rod or pull & tear the curtain. Each seashell hook will look gorgeous as a piece of bathroom decoration for your shower. 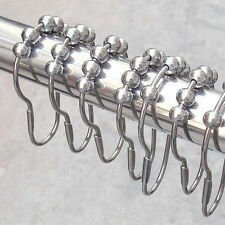 Decoration for your shower, or even for your bedroom, bathroom and living room curtain rail. 12 x Shower Curtain Hooks. Trending at C $16.97eBay determines this price through a machine-learned model of the product's sale prices within the last 90 days. Tired of searching a special shower curtain for your bathroom?. Try our new waterproof polyester fabric shower curtain with latest design. Custom Shower Curtain 60" x 72". This polyester shower curtain is able to print a vast range of colors with a fine degree of detail. Tired of searching a special shower curtain for your bathroom?. Try our new waterproof polyester fabric shower curtain with latest design. You got 1 Pcs Shower Curtain. Custom Shower Curtain 60" x 72". Also good for hanging. Inside dia. is about 1 1/4". Length is about 2 3/4". Shower hooks are accessories for the bathroom that fit onto the shower curtain rod and hold up the shower curtain. The shower hooks are needed in a bathroom that does not have a wall or door enclosure for the shower. In addition to being functional, shower hooks for the rod are also decorative and can add a fun look to the bathroom. What materials are shower curtain hooks made from? Stainless steel - Stainless steel with a brushed nickel finish is a good material for shower hooks and a coordinating rod. These hooks for the rod are often outfitted with rollers for ease of movement. These hooks could also have a gold finish applied to them. Plastic and acrylic - Plastic and acrylic shower curtain hooks are lightweight, naturally resist rusting, and come in a variety of colours, sizes, and styles. Chrome and metal - A chrome finish on hooks for the shower helps metal shower curtain hooks resist corrosion from daily exposure to water in the shower environment. What are the features of shower curtain hooks? Adjustable - Adjustable hooks are able to accommodate a shower rod that adjusts in height. Adjustable hooks can also fit a shower rod from one to two inches in diameter. Rollers - Rollers on the shower curtain hooks allow them to slide along the shower rod with ease. When taking a shower, this allows for easy adjustment of the rod. The rollers are usually shaped like beads and finished with chrome, gold, or brushed nickel to coordinate with the other bathroom fixtures. Decorative - Shower curtain hooks may have decorative features such as floral, animal, geometric, or beach designs. These decorations for shower rod hooks are resistant to moisture and mildew. Corrosion-resistant - Hooks used in the shower need to be resistant to rust, which is formed when metal comes into contact with oxygen. Coatings such as gold plating, brushed nickel, or alloy are applied to the shower curtain hook in order to extend the life span of the metallic parts. How do you put shower curtain hooks on the rod? Open up the hook. Most hook types will open manually by using your hands and pulling gently on the top and bottom of the hook. Some hook types have a lobster-claw clasp that requires lifting up and outward. Once the hook is open, slide it onto the shower curtain rod. Align a hole of the bathroom shower curtain with the lower part of the hook. Push the end of the hook through the holes of the bathroom curtain and liner. Close the hook and secure it on the shower curtain rod. Slide that first hook to the end of the shower curtain rod. Repeat this process until all of the hooks are inserted through the curtain holes and rod.